Ecofix helps create a healthy ecosystem for pond fish, makes pond water clean and clear, breaks down dead algae and increases oxygen levels in pond water. Murky, cloudy water keeps you from enjoying your pond and fish as much as you would like. In addition, dissolved organics and sludge build up and reduce the oxygen concentration in the water, creating a breeding ground for disease-causing, pathogenic bacteria. Ecofix contains five strains of live bacteria that digest sludge and reduce dissolved organics, making pond water clean and clear. The bacteria, which remain in a dormant state until added to the pond, become active and begin consuming the organic substances responsible for cloudy, hazy pond water. Ecofix will never smell like rotten eggs" which is caused by the build-up of toxic hydrogen sulfide. Ecofix needs no refrigeration and should be stored at room temperature. Accidental freezing of the product will not reduce its performance in the pond. 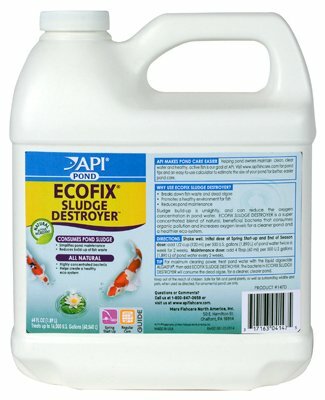 In cold water (below 40°F) the activity of Ecofix as with all bacterial products will be reduced. ".